This is an excellent debut album by what is basically a duo. There are eleven tracks and it clocks in at just under half an hour in length, but don’t worry about that, it is an album that you need to play over and over again to pick up on all of the nuances. Ryan Eastlyn plays guitar, lead vocals and writes the songs whilst Braxton Brandenburg adds his versatile double bass playing to the mix on this unusual, sparsely atmospheric brew. It consists of rockabilly flavoured roots music that incorporates elements of ‘that old weird America’ with a blend of 1950s roots music into an edgy stew entirely their own. They are supplemented on this tremendous album by Mike Sasich and Brad Wheeler both who added lead guitar parts to various tracks to enhance and fill out the sparse sound. It wasn’t absolutely necessary but it does help to add an element of unpredictability, although on an album of this quality and with Eastlyns darkly atmospheric vocals and songs it already has that to a large degree. The sound is open and spacy and actually does evoke the wide open desert spaces around their home base of Salt Lake City albeit on a dark night! Eastlyn’s vocals are a little reminiscent of a 1950s Johnny Cash in rockabilly mode, but after a very heavy night, as is the music! 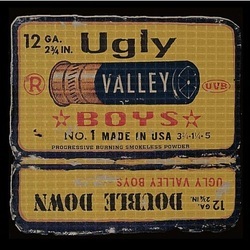 The basic instrumentation is classic rockabilly and yet although that genre is the closest reference point the music of the Ugly Valley Boys is much darker. It’s almost as if they are a pair of old 1920s ‘hillbilly’ musicians transplanted to the wide open desert in the 21st century and who managed to find a couple of 1950s rockabilly singles in their collection for use as some sort of lynchpin to the modern day! Whilst those deep dark vocals give the album an atmosphere that reaches far beyond rockabilly, most of the songs can’t be listened to without a lot of foot tapping due to the incessant repetitive beat and some really strong melodies. The opening song Pappy, isthe story of a bootlegger and manages to, despite the mid-tempo rockabilly beat, conjure up a suitably edgy feel. Alota guns is a haunting song with a nice melodic lead guitar that seems to say that for some people loneliness is the better option that helps to avoid heartbreak whilst Power lines tells a similar if much darker tale to ‘Wichita linesman’! Silver City is a quite haunting speedy tale of a mining town with Eastlyn getting as near to a yodel as he is ever likely to! One (very) minor criticism relates to that sparse driving beat, that despite speed variations can get a little too repetitive being a little too forward in the mix. However, I’m guessing the budget for recording was small and the main priority was to get these excellent songs to where they could be heard by more people and despite this minor criticism, this really is an excellent and highly original album by a duo, that given a bigger budget have the potential to go on to even greater recordings! . A really refreshing kick up the back side for country music!